This is a widespread species that is starting to become threatened with local extirpations on the edges of its range. It is stable and secure throughout the majority of its range. This species occurs in the Upper Mississippi and Ohio river drainages, south to the Tennessee and Arkansas rivers. Ranges from Wisconsin and Minnesota, west through Kansas to Oklahoma, south to Alabama, east through West Virginia and Ohio. It is also found in the Cumberland River (Tennessee and Kentucky) and Tombigbee River (Alabama and Mississippi). It is considered endangered in Ohio, threatened in Wisconsin, and is extirpated from Pennsylvania. The species formerly occurred in Mississippi in the Pearl River and Pascagoula River drainages (and the Yazoo River drainage as archaeological specimens only) but is now extirpated. Comments: The monkeyface has a very prominent posterior ridge and is sometimes strikingly marked with dark triangles. By viewing the shell edge-on and using your imagination you can see the face of a monkey. It is a river species and is most common in riffles and swift runs. Because of its heavy shell, white nacre and decent numbers, it was also targeted in the button and cultured pearl industry. Its population density has apparently been increasing at some sampling sites in southeast Kansas. 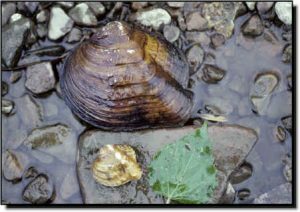 This is a positive sign for all native mussels. 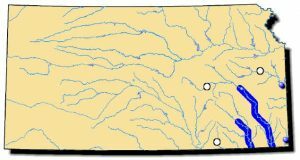 However, it is absent above some of the large mainstem reservoirs in southeastern Kansas.